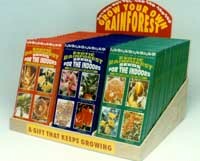 Rainforest Seed Co. - Product Info. Restocking of orders will happen on a bimonthly basis by a Rainforest representative. Should you require an order before then, contact us directly at the above address. 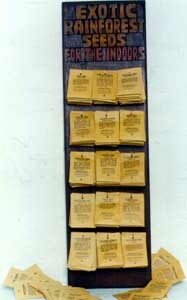 1 hand carved display (holds 150 loose packages 10 per variety on 15 brass styled hooks, also included 1 color display of 15 species, 1 color 6 pg. pictorial, pamphlets and germination tips, plus information on related ecological and educational foundations. Available in English/French. Hand crafted seed necklaces made from some of the most unusual and colorful seed. The centre piece Amazon grape holds a unique spiritual value, said to be the guardian of the rainforest, it is also called the ghost head as its shell resembles a tribal facemask. 4 series available. Each box contains pictures of species, 4 packages rainforest seed, tips on germination and catalogue information Plywood container holds up to 40 boxes. 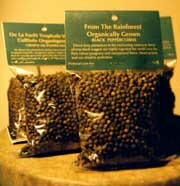 115-gram bags of our very own Organically grown. Harvested and prepared from our farm. Taste the essence of the rainforest in each nugget. Packaged in English and French. Plant medicine is the oldest and most popular form of healing in the world. Eighty percent of the earths inhabitants rely on it. Most medicinal plants come from the Rainforest. In the Amazon basin alone, over 6000 varieties are utilized as cures. Worldwide over 3000 different species are used in prescriptions. But what makes plant medicinal different from chemical medicinal is the use of the plant itself in simple preparations such as tea, while modern pharmaceutical drugs derived from plants use only a single ingredient from the plant excluding the dozen or more other compounds which make that plant so effective and safe as a medicinal. Costa Rica sits atop the most diverse medicinal plants in the world. Hidden deep inside its lush rainforest may lay the potential cures for such scourges as Cancer, Aids, Parkinson's Disease and others. Many huge pharmaceutical companies such as Merk and Smith Kline Beecham are currently researching the possibilities. For over a decade, the National University of Costa Rica has been engaged in extensive laboratory research into hundreds of medicinal plants, focusing on narrowing the gap between the folklore attached to these plants and solid scientific fact. They have been extremely successful in establishing the legitimacy of natural cures for dozens of ailments. We at the Rainforest Seed Co. have been privy to this fascinating success and are proud to introduce an array of plant teas for curing many common ailments. These teas are pleasant tasting and can be prepared in minutes. They are non-toxic and contain no narcotic substances. Most important they have no short or long term effects, unlike some synthesized product. In reality these liquid infusions are not new, they have existed for countless years from certain folklore remedies passed down from generation to generation, prescribed by Mother Nature, herself. Each package comes complete with simple instructions on suggested amount of consumption per teaspoon .It is strongly recommended that you adhere to the schedule of consumption listed for each infusion of tea to obtain results. It is recommended that you take this infusion without additives like sugar or milk, but if you wish natural honey is also used as a sweetener. All packets contain approximately 10 teaspoons. Price per package: $3.25 postpaid.